We know the King's Daughters Home is a beautiful piece of Durham history that needs to be preserved. Our vision for the future of the King's Daughters Home is to lovingly restore the building. We would like to re-open the King's Daughters Home as a bed and breakfast - The King's Daughters Inn. The Inn would operate for the Duke and Durham communities as a convenient place to welcome visitors and showcase a fantastic piece of Durham's history. This promises to be a great addition to the neighborhood -- and will be some interesting competition for the "boutique hotel" Residence Inn or what-have-you that's slated to replace the old McPherson Hospital site nearby. A B&B could be a great fit for the area in terms of market demand (given the proximity to Duke, Brightleaf, and downtown) while helping to retain a building with real beauty and character. The Crossmans promise an update and more details at next Wednesday's Trinity Park Neighborhood Association meeting. 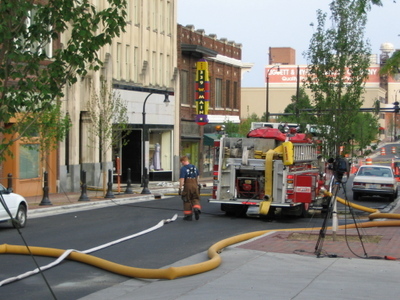 According to WRAL, the fire occurred on the seventh floor (which contained at least one penthouse apartment); the owner was not home at the time of the fire. Other floors have been affected by water and smoke damage, but there were no injuries. Besides the lack of any human injuries, this is a bullet dodged for architecture in downtown. The Snow Building is a gorgeous example of art deco right in the heart of downtown and you can spend forever lingering in front of the building, gazing up at the intricate designs set into the facade. The local funnies reported that when David Johnson's family of dealerships bought up Elkins Chrysler/Kia in downtown Durham, the plan was to move the dealership from downtown to the Southpoint Auto Park off NC 751 at I-40. Heck, the Elkins dealership's new "Johnson" signs are currently just banners over the old Elkins name. Looks like they may not bother replacing the signs. According to Tuesday's Triangle Business Journal and Wednesday's N&O, Durham developer Scientific Properties has purchased the six-acre site and intends some mix of retail, residential, or housing on it. The location of the dealership -- which is sandwiched between Mangum and Roxboro Streets just north of NC 147 and just south of the new Durham County courthouse -- is a real strategic win for Scientific. It provides a 'missing link' in connecting their Venable project with the Heritage Square project they have proposed just south of 147. 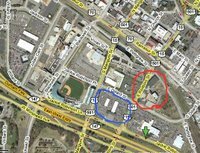 (In the image at right, the Venable is in red, the dealership in blue.) Furthermore, it connects to the ballpark and American Tobacco Phase III right to the west of the property -- though with Mangum in the way and the inward-focus of ATHD, it'd take herculean feats to create pedestrian-scale connections there. I'd personally guess that Scientific doesn't have any immediate plans for the space and won't until they finish leasing up the Venable and get Heritage Square and Golden Belt well along the way. Still, this remains a major land acquisition and one which gives them a much-increased physical presence in downtown. Though there are a couple of oddities in the film -- including presenting the Bickett Gallery and its owner in a discussion about Durham without acknowledging the Bickett is a Raleigh institution, or throwing scenes of Southpoint into a discussion about the plans for lofts and retail into a segment on West Village -- the 10-minute piece, created by CurrentRutledge and titled Decidedly Durham, still presents an outstanding overview of Durham's revitalization. Among the film's feature subjects: discussions of the American Dance Festival and Full Frame, a spotlight on the Nasher Museum, scenes from West Village, American Tobacco, and Brightleaf, and extended interviews with Ben Barker of Magnolia Grill and Grayson Currin from the Independent Weekly. Duke gets the heavy share of coverage you'd expect from a Duke-produced piece, with a feature on Duke Chapel followed by a look at Cameon Indoor Stadium -- or as the talking head on the film calls it, the "second holiest building on campus." If you have iTunes installed on your computer, watch Decidedly Durham at this link, or access it from the Duke Law section of itunes.duke.edu. The new owner of the old Fowler's Gourmet at Peabody Place downtown is holding an inventory clearance sale this Saturday for bottles of wine left in inventory from the old store, in advance of its reopening as Parker & Otis in June. There will be wines from all major regions with reds and whites priced to sell fast! All wines will be sold at discounts from 50-70% off the retail price with wines starting at just $3.00 a bottle. Join us from 10:00 am - 2:00 pm on the back porch Saturday June 2nd for this exciting event. Here's hoping we can get a peek inside the new store while we're at it. The rejuvenated Broad Street Cafe will start closing on Sundays after 3pm and will be closed every Monday in June and stretching into July. Fear not, Cafe-fans -- it's actually good news. The Cafe's owners will be renovating the facility inside and out during these work days. The biggest change is the addition of a cold kitchen, which will allow made-on-premises sandwiches, salads, soups, wraps, and baked goods. Beginning in August (with the help of some new staff) the Cafe will begin offering lunch from 11am-2pm and will be bringing out a new menu. Inside, the owners are planning to add new and improved lighting, sealed floors, and updated bathrooms; outdoors, new tables are promised along with the possibility of some murals overlooking the parking lot. There will also be an increased focus on displaying and playing local artists' music -- a natural fit with the growing number of performances taking place nights at Broad St. Coupled with the addition of the Watts Grocery restaurant later this year and the relocation of High Strung from the high-priced Ninth Street, it's good to see the Broad Street retail district is adding some new activity. I "Tasted Durham," and it tasted just like chicken! So I didn't make it out to "Taste of Research Triangle Park at Durham" for this year's festival. Too busy getting caught up on things around the house and the like. Besides, if we wanted Cold Stone Creamery or Johnny Carino's food, we'd drive to Southpoint -- and if we wanted to eat at George's Garage, we'd just hop on our bikes and ride over to Ninth Street. Of course, the local press took predictable sides on it. The Herald-Sun focused on the move from Brightleaf Square in their second paragraph, and printed some positive opinions from several attendees, while noting that at least one attendee felt it "would be more fitting for it to be in downtown Durham or somewhere closer downtown." The N&O, for its part, stated that "few seemed to notice" the move, and that one Durham resident in attendance noted "it didn't make any difference to me that it was here." So the festival was a big success, right? Well, perhaps not so fast. On Sunday morning I was intrigued to find a thread titled "Taste of Durham lame" over at the City-Data Triangle forum. Three board regulars attended -- and all three of them gave it a thumbs down. "Did anyone else go to the Taste of Durham this weekend and think it was kinda lame? We went Raleigh's Artsplosure the weekend before and thought Taste of Durham paled in comparison. - Location. Artsplosure was in downtown Raleigh and had a great vibe. Taste of Durham was held in a freaking parking lot in RTP. All in all I was thoroughly disappointed. I'd be interested to see if anyone else went and felt differently." This opinion from a Raleighite who made the trek over from Wake County to attend the event. Interestingly, he couldn't believe the event wasn't held downtown. Perhaps some T-shirts should have been sold for the event: "I went to Taste of Durham and all I saw was a freakin' parking lot." As a relatively recent transplant to the Triangle, I'm still fascinated by what factors into new residents' decisions on where to live in our geographically dispersed region. As I've pondered this question, I've often come back to David Rollins' casual anecdote on a listserv a few months back stating that most of his co-workers coming in from Manhattan and Brooklyn chose Durham while the suburbanites fled to Cary. This has never surprised me as a concept; after all, a person more familiar and comfortable with life in the big city would more likely prefer the environs of Brightleaf Square and Ninth Street to, say, Triangle Town Center or the US 70 strip out in Clayton. (Or at least that's the calculus my wife and I made when leaving Harvard Square for North Duke Street a few years back.) But I've never had any data to back up what's been just a strong supposition. In this graph, the counties in red saw Wake outdraw Durham as these new residents' home in numbers disproportionate to the difference in sizes of the counties. The green counties may have seen Wake draw more of these transplants than Durham in nominal numbers (Wake is more than three times Durham's size), but Durham still drew more than its proportionate share of these new residents, suggesting transplants from these areas tended to find Durham more attractive as a new home. New York City: Manhattan and Brooklyn all fall squarely in the Durham column, as does Essex County, NJ (home to The Oranges and Newark along with more suburban communities). 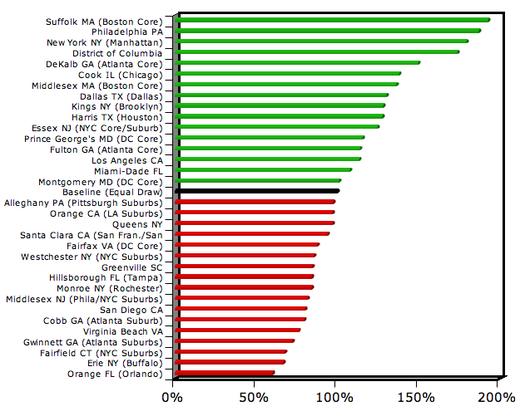 On the other hand, suburban destinations like Westchester NY, Fairfield CT, and Middlesex NJ fell to Wake. Queens split down the middle, more or less. Boston: Durham did well with the Hub of the Universe, disproportionately drawing transplants from Suffolk and Middlesex counties, which include the core of Boston and left-leaning communities like Cambridge, Somerville, Arlington, and Lexington. We didn't do as well with Worcester County, the more suburbanized 'burb in the state's midsection. Wake County drew 348 residents from "Woostah" -- Durham just 17. Central Florida: Ahh, the I-4 corridor, home to Karl Rove's political barnstorming to capture votes from all the subdivision cavedwellers lurking between Orlando ("The City Homicidal") and Tampa ("Dismay by the Bay"). No shock here: Central Florida half-backs leaned heavily to Wake County. As an escapee of the soulless Orlando metro area, I say to Wake Forest and Holly Springs, you can have 'em. Miami, meanwhile, is solidly Durham. Atlanta: This is one of my favorites. The counties generally considered "core" to Atlanta, DeKalb and Fulton -- racially and socioeconomically diverse and denser communities -- fall fairly squarely on the Durham side of the house. Gwinnett and Cobb Counties, on the other hand, are pretty clearly Wake strongholds. Ahh, Cobb County, one of the conservative backwaters of Atlanta, whose school board most recently waged a four-year fight at taxpayer expense to keep "evolution is just one theory" warning stickers on evolution textbooks. Once again, Cobb County residents: When you take I-85 to the Triangle and reach Durham, please keep on driving, guys! Have you thought of Fuquay-Varina? I'd take these numbers and this kind of migration pattern any day of the week. 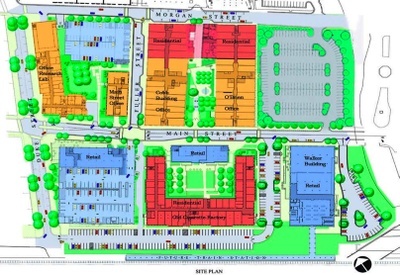 Let's come back to the West Village project and take a look at the other half of Phase II -- the buildings between Main St. and Morgan St. (If you missed it, please see the previous post for thoughts on the overall site plan and the Chesterfield/Walker buildings. First up: 700 W. Main St., the old Main Street Office building. "Non-historic additions" are being removed and the space will be returned to 8,500 sq. ft. of Class A office space on each of two floors. Each floor is for a single tenant only (no subdividing). The new structured parking deck along Morgan St. will back up close to the 700 W. Main building, with a new green space on the interior of the Fuller/Main/Duke/Morgan block. Unfortunately, this continues a trend that exists throughout a lot of West Village and American Tobacco: Blocks that open upon themselves and provide vistas and green space at the center of a small complex rather than at the edges. Similarly, the Morgan St. garage will plop down right along the street; it's not clear if there'll be any architectural facing to make the garage look, well, like something other than a garage. No news to publish at this point on the "Office/Research/Lab" building along Duke that comprises the remainder of the block. Until fairly recently this was actually still active laboratory space for Vector Tobacco, but I believe this will be reverting to other uses. 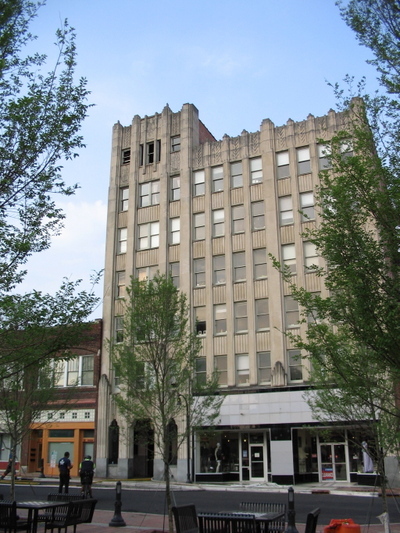 Next up are the Cobb and O'Brien Buildings, which together comprise the only buildings on the block bounded by Main, Fuller, Morgan, and the downtown loop. Of course, as discussed in the last post there's plenty of room to do something much more interesting with that empty parking lot, but logic presumes that's some time off in the future. Anyway, both the Cobb and O'Brien warehouses will be mixed-use, accommodating loft-style apartments on their north side (nearest the existing apartments complex), with each having 20,000 sq. ft. of Class A office or "service retail" space on the south side, facing Main. 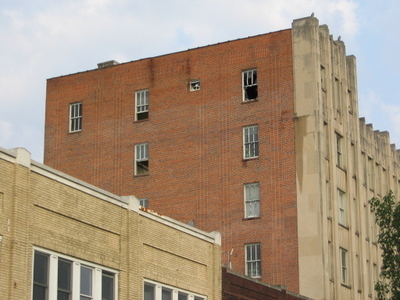 (In the floor plan, the apartments are at left.) Interestingly, hardwood floors are being proposed for these two buildings as opposed to the flat carpeting that predominates the office space world. The asphalt between the two will be ripped up and replaced with a landscaped courtyard. A last item of interest: not visible on yesterday's site plan rendering is something that can be seen over on a different version of the site plan printed on the leasing flyer for the Walker building: proposed "West Village condos" at the corner of Fernway and Liggett/Washington St., near Tosca's and the Power House building at West Village. With all the other condo construction planned for downtown, it's an open question as to when or if projects like this will come to fruition -- but it does hold out hope that at least one big open parking space in this part of downtown could become something other than a grandiose field of impervious material. Colliers Pinkard has posted building information and property flyers to CoStar, the commercial property leasing database. Today let's walk through some of the highlights of that material. A few things stand out on this plan. 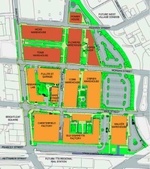 First and foremost is the significant attention to parking adjacency in the plan. There's a parking structure rising currently off Morgan St. near the cluster of office space/labs, but at the same time, the plan calls for the lowest level of the Chesterfield factory to serve as parking as well. (I'm not sure if this was extant parking in the factory as built or a conversion of the lowest-floor space.) Additionally, there's significant new surface parking on both sides of the Walker Building, with the western Walker lot circling back through to the lot nearest the train tracks. It's interesting to see the clustering of retail along Main Street. There's always a challenge of downtown shopping/retail districts in trying to appeal to those who are looking for a leisurely, walk/bike experience to get to a store versus commuters or out-of-town visitors who want to park right near the front door. As designed, the retail space along Main provides a single-strand that can appeal to strollers and is an easy connection from Brightleaf/Peabody Place. At the same time, car-bound visitors have surface parking at Walker, along the train tracks, and on the ground floor of the Chesterfield -- along with a surface lot loop pattern that provides a quick-out connection back to Main Street. At the same time, the use of the buildings north of Main for office space, along with some mixed retail, makes sense given their proximity to the new structured parking deck. Quick-in/quick-out is not as much a factor for the office drone commuter (wait, creative class office drone -- sorry! ), making this a better home for this use. It should be noted that, in the long run, it would be great to see something more creative done with the surface parking lot to the east of the O'Brien building, which (with the DATA station and the abysmal Downtown Loop) contributes to the feeling of 'dead space' between downtown and West Village/Brightleaf. Today, a look at the key buildings on the south side of Main. Later this week, we'll come back to the north side of the complex.